BISHOP, Cecil William (Runt), a Representative from Illinois; born on a farm near West Vienna, Johnson County, Ill., June 29, 1890; attended the public schools, and Union Academy, Anna, Ill.; learned the tailoring trade; worked as coal miner, telephone linesman, professional football and baseball player and manager; engaged in the cleaning-tailoring business 1910-1922; city clerk of Carterville, Ill., 1915-1918; postmaster at Carterville, Ill., 1923-1933; elected as a Republican to the Seventy-seventh and to the six succeeding Congresses (January 3, 1941-January 3, 1955); chairman, Special Committee on Campaign Expenditures (Eighty-third Congress); unsuccessful candidate for reelection in 1954 to the Eighty-fourth Congress; congressional liaison assistant, Post Office Department, Washington, D.C., 1955-1957; superintendent of Division of Industrial Planning and Development, State of Illinois, in 1957 and 1958; Department of Labor conciliator for State of Illinois, 1958-1960; retired; died in Marion, Ill., September 21, 1971; interment in Oakwood Cemetery, Carterville, Ill.
Papers: ca. 1915-1962 , 2 linear feet. The papers of C.W. Bishop contain correspondence, printed materials and political fliers. 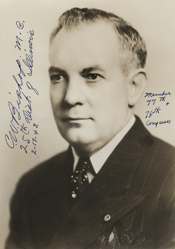 The bulk of the material is from Bishop's time as superintendent of the Illinois state Division of Industrial Planning and Development, 1955-1957.